Voila! 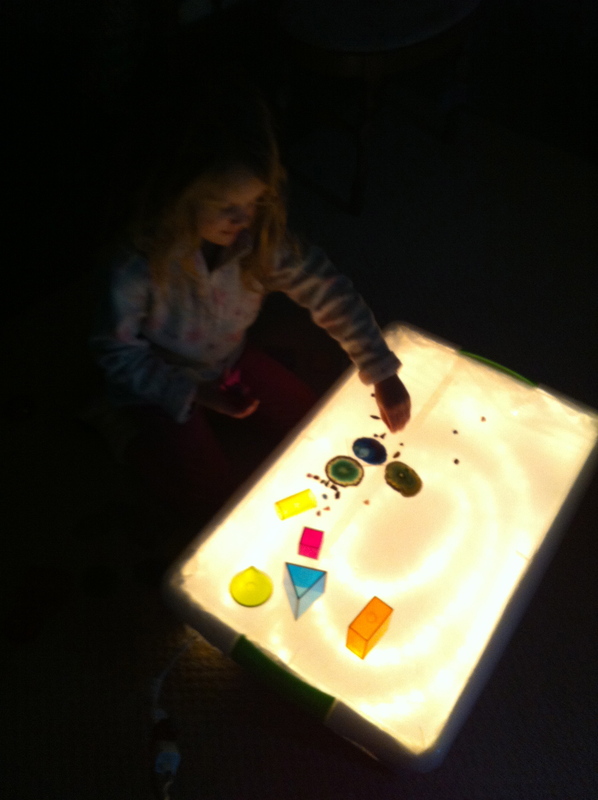 Make a Light Box For Your Kids!! The learning activities, art and fun just might be limitless! 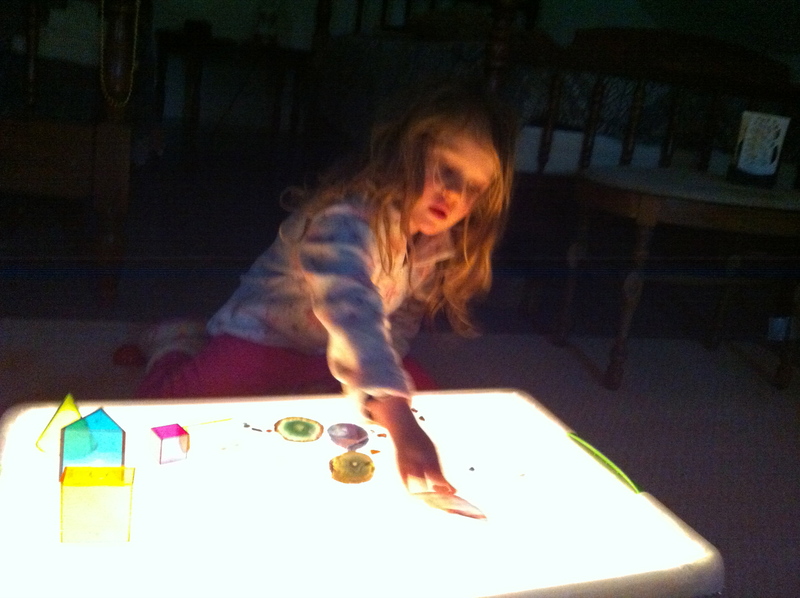 Okay, there is A LOT of information floating around online about light boxes and their many fabulous uses for kids. My only regret is that I didn’t make one of these when Captain was a toddler! I apologize that I don’t know who to credit for the way that we put this together, as I can’t remember exactly where I gathered the bits and pieces of information needed to assemble this amazing, simple box. And so, to all of the people who have made this before, I thank ya! Basically, it is a lighted box that enables kids to do a large number of activities including learning projects, crafts, and just plain fun. 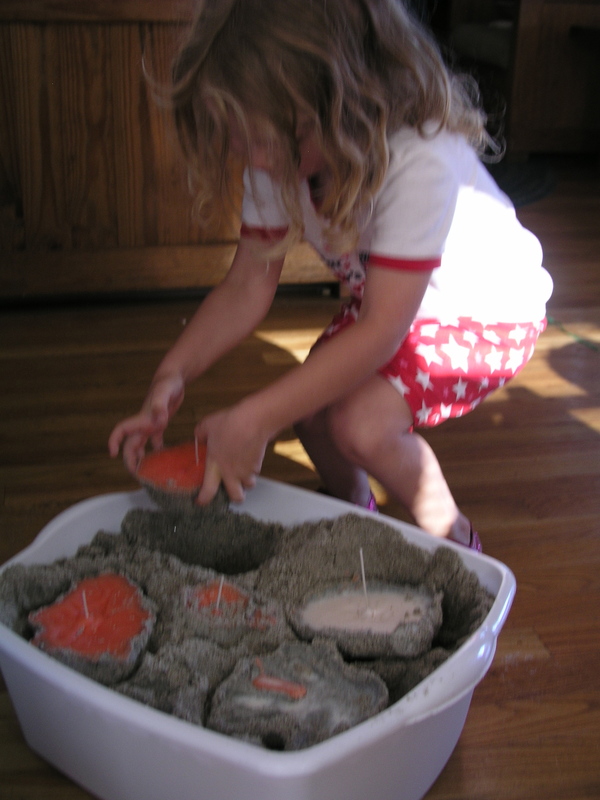 Some activities include, but are not limited to: Looking at agate slices, sorting colored beads or round pieces of glass (or any clear, cool stuff which is great for the toddler “sorting” phase), transparent geometric shapes, a squirt of shaving cream, colored sand shapes, finger painting, stacking plastic cups in assorted colors and the list goes on…. You’ll need: a plastic tub with locking lid, no deeper than 6 1/2″, a string of basic rope-lights ,(at least 9′, after Christmas they are on blowout sale), aluminum foil, waxed paper, clear packing tape and something to drill a hole in the plastic box to fit the lighting cord through. We used a Dremel. It took about 10 minutes for K and I to put this together. First, lay out the rope lighting inside the box so that you can gauge where to drill the approximately 1″ hole in a corner that you’ll need for the cord. Remove the lights and drill the hole. Place a layer of aluminum foil inside the box on the bottom and sides (this helps concentrate and reflect the light) and tape it down. 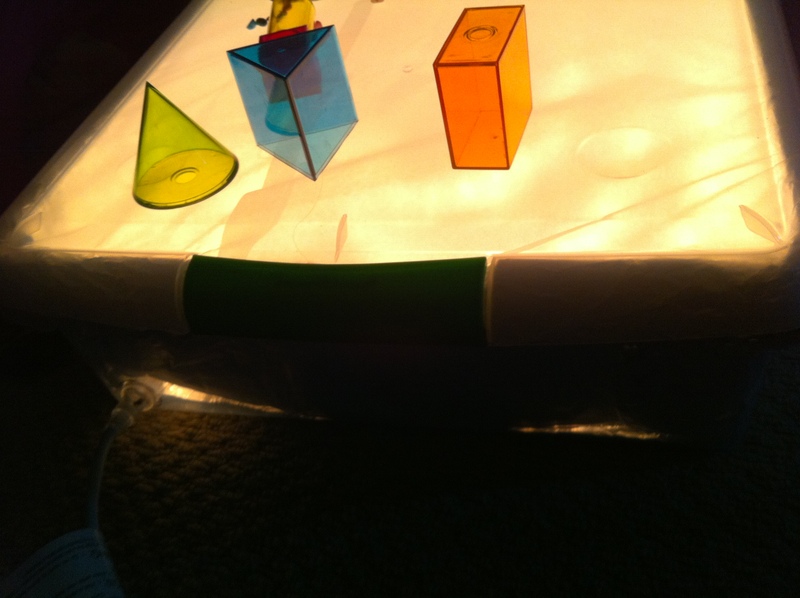 Replace the rope light in a neat coil that spreads out over the bottom pretty evenly and tape it down. On the inside of the lid, tape down a layer of waxed paper. Put on the lid and plug it in. Close the curtains and shut out the lights. Voila! They’ll come running!! First, many have made this using a 12×12 scrapbook storage box, but I found it to be kind of limiting so I went for something bigger. I found a 6.25″ H x 18″ W x 28″D clear plastic underbed storage box made by Iris on Amazon.com and it is perfect. I bought 2 for 31.99 with free shipping. If you do find a different tub, make sure that it has a smooth, flat top, not grooved (very important!). I highly recommend these products both of which I found on Amazon.com, all had free shipping: Agate light table slices, set of 12 for 18.95. With these, you don’t know what colors and shapes they will be and it is quite fun to open up the box! Also, Learning Resources makes a set of view-thru geometric solids for 14.35 and very quickly Captain knew what pentagons and hexagons are. They are great for filling with little rocks, stacking, sorting, and building things with too. 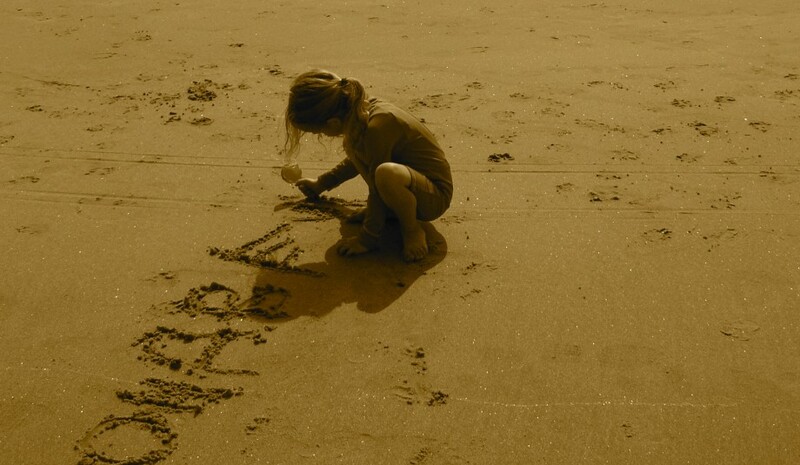 Ahh, I must be dreaming of warm days on the beach again! 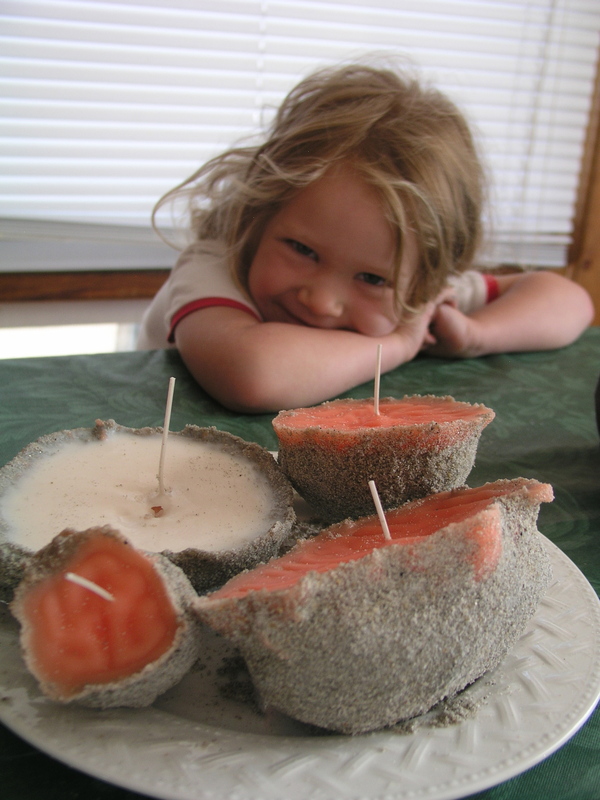 Captain and I made these fabulous candles when we were on vacation with Grandma and Grandpa in New Hampshire during Hurricane Irene. They are extremely simple and fun! If you use a lot of candles, you can melt down your leftover ends for a beautiful lesson in recycled crafts. 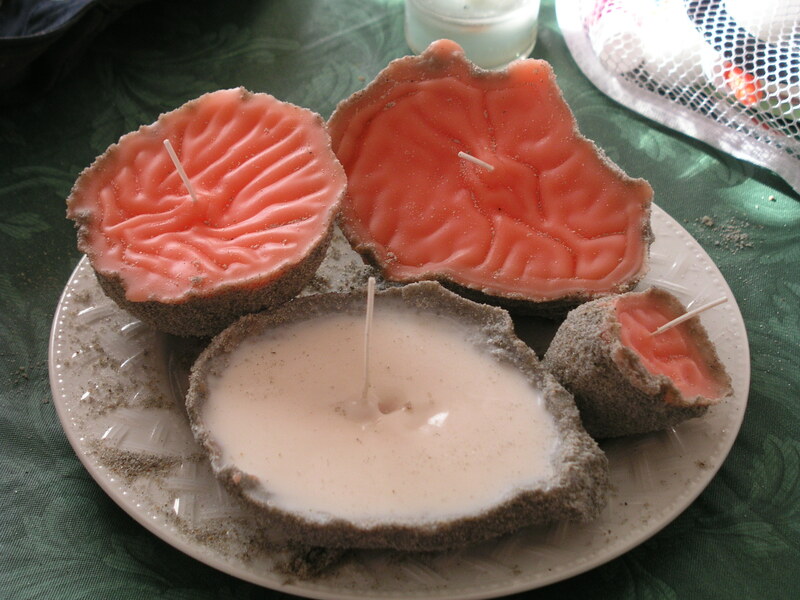 We didn’t have any candle stubs but fell madly in love with the peachy-orange color of wax flakes that I found at Michael’s Craft Store (I also got the short votive wicks there). We lugged home a bucket of sand from the beach and packed it tight (it should be moist) into a tub. We each took turns scooping out sand to make a little form. A perfectly smooth, round form is nice, but we really loved the ones that were more free-form the best. What you need: Chunk of wax, approx 1 lb, clean empty tin can (24 oz size works well), saucepan, short votive wicks with metal clip on bottom. Make smooth mold and place wick so metal is on the bottom, wick straight up. Mom’s job: Boil water in saucepan and melt wax completely in the tin can which is set in the double boiler. Be very careful with the hot wax on the stovetop. Pour wax leaving at least 1” of wick exposed. After the wax hardens, lift them out and dust any loose sand off the outside. We used orange and cream layered wax and they turned out beautifully! Captain really liked Grandma’s because “it looks like the shore and mine looks like the ocean where everyone runs into the waves.” She was very excited to take home a very special candle for her Dad. I originally got this idea from my wonderful mother in law Judi, who made these back in the 70’s. There is also a project listed on education.com. Here’s to summer dreams and the smell of sand, sun and the ocean!